It's important for children to learn another language. Not only do most colleges expect it, but it teaches them a whole new way of thinking. Other languages work differently than English, and it is a good brain workout! We have struggled to implement foreign language in our homeschool; the girls haven't been terribly motivated and we've had plenty of other things to keep us busy. They took an excellent Spanish class at out homeschool co-op, but they only went twice per month. Foreign language instruction really needs to be more often that that. I was intrigued when I looked at the Spanish for You! curriculum, and pleased to have the opportunity to review it. Spanish was a good place for us to start, since the girls were a little familiar with it already. We received a physical copy of the Estaciones workbook; downloadable audio files of the entire book, including audio with a native Spanish speaker; PDF downloads of self-correcting worksheets, a weekly lesson guide, and flashcard/activity game pictures. It's a year-long program (24-27 weeks), intended for grades 3-8, and the recommendation is to use it 4 days per week. Debbie Annett, the author of Spanish for You!, has been teaching Spanish to all ages for 14 years, and was in international business for 8 years before that. She spent time studying in Spain. She wrote this curriculum to be effective, flexible, and affordable, and to work for multiple ages, with or without prior Spanish experience. She wanted to create a program that would flow well into any high school Spanish program. Because each book is written to be used with many ages and levels, they are theme-based, rather than leveled by grade. Currently, there are two books available: Estaciones (Seasons), and Fiestas (Celebrations). A third theme, Viajes (Travels) is available as a short trial unit; the complete package will be available in June 2013. As we began to use this program, I was a little confused. It's very different from how I remember learning Spanish! I finally decided to STOP trying to remember what little I knew of Spanish and just go with the way the program was written - and I have been VERY impressed. As a Charlotte Mason homeschooler, I've been trying to learn how Miss Mason would have implemented foreign language instruction. I've heard a lot about Gouin Sequences, and have recently started to learn how they work. François Gouin was a French teacher of Latin who tried to learn German as he had learned Latin - through grammar and translation. Apparently he memorized thousands of German words, translated Goethe and Schiller - all without actually speaking to someone in German - and found he could not hold a conversation with a native speaker. He ended up having children teach him simple phrases, like "Open the door." He found the key to be speaking and interacting with a language. This is what I found in Spanish for You! Our book, Estaciones, is about seasons. We've learned the days of the week, the months, of the year, and how to talk about the weather, as well as things you can do in each season of the year. From the beginning, we learned to say things that we could put into action - to look at things, to write things, to draw things. Each unit starts out with vocabulary, and making flash cards; then some verbs and conjugating so you can use the vocabulary, and then some grammar, so you see how it all works together. 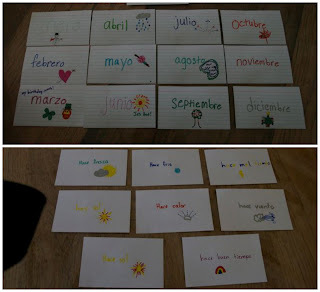 The flash cards are not for "kill and drill," by the way; they are to help the students connect with the words while they make their cards, and then there are several options for activities using them listed in the front of the book. As we've learned more and more words, we've been able to speak to each other in Spanish a bit. We're able to use the language - and that is key to being able to think in it and speak it well. When we received our downloads, I saved them to the computer, and printed out the 7-8th grade lesson plans and the first set of worksheets. On our first day, the girls made flash cards. They had a GREAT time doing this. I forgot that images were included for the cards in a PDF, so they made their own. Once the flash cards were made, we moved on to practicing what we'd learned. 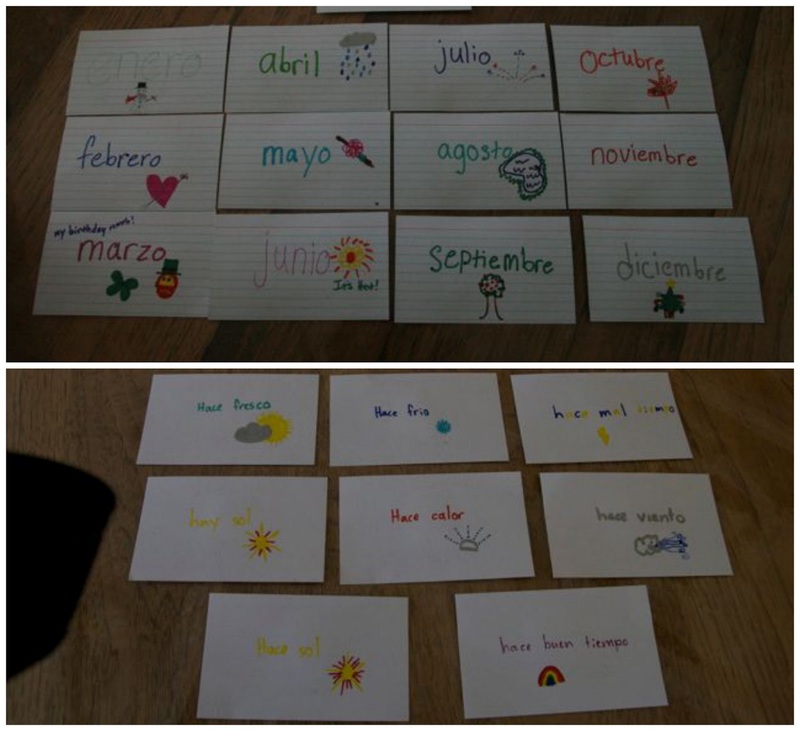 First, we had just a few commands - "Mira," which means look, "escribe," which means write, and "dibuja," which means draw. With a piece of paper in case they needed to write or draw, I read the commands and they would do them. It got to be more fun when we learned a little grammar, and could ask each other about the weather, what month it was, what the weather was like during a particular month, etc. My girls are at that tween/early teen age when they can't admit to having fun with anything, but *I* enjoyed speaking Spanish with them, and I think they enjoyed speaking it with me, as well. This is a great program. You don't need to know any Spanish to teach it - the audio files read everything for you! 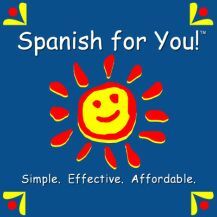 If you're looking for a simple, affordable way to teach Spanish in your homeschool, I hope you'll consider Spanish for You!